Fort Lauderdale's port, Port Everglades, is the embarkation point for many Caribbean cruises. Fort Lauderdale is 30 miles from Miami and well known as a spring break destination. Port Everglades is a huge port. The only public transport runs along SE 17th St by the port's north entrance. Unless you are at Terminal #1 or #2 (used by Princess), you will need to take a taxi to your terminal or face a long walk. 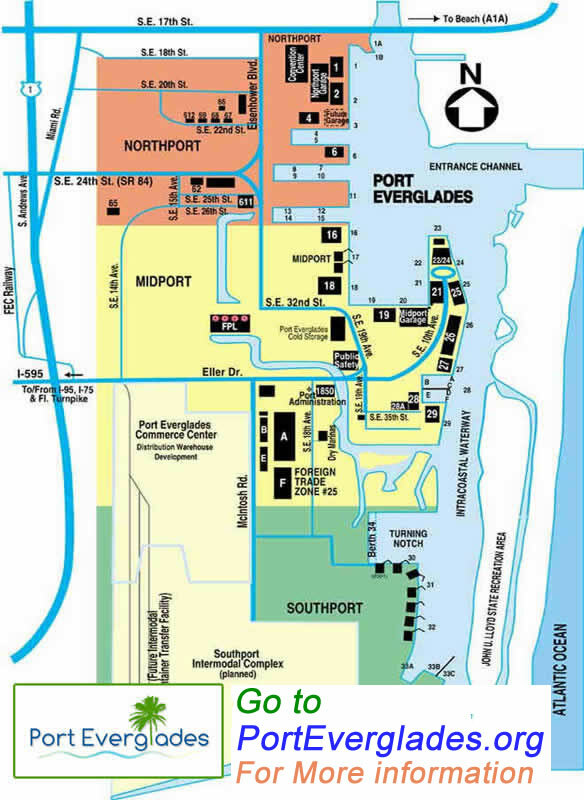 You can check the port schedule linked from here http://www.porteverglades.net and https://pevvesseltraffic.broward.org/webx/ but cruise berth assignments are posted at the gates. Port and google map links are in the Maps section below. You can use either Miami International or Fort Lauderdale Airport though Fort Lauderdale is much closer. If coming from Miami International Airport, it may be cheaper to take the SuperShuttle shared van service. Near Port Everglades, there are banks and ATM's along SE17th Ave including a Bank of America. When dining in restaurants or taking taxis, it is customary to leave 15-20% tip since workers make minimum wage. Fort Lauderdale's main attraction is miles of sandy beach and sunny weather. Miami is not too far away. SE 17th has good shopping with the Walgreens at the north port gate for last minute items. Southport Shopping Center is nearby with a Ross Dress for Less, Dollar Tree, and Office Depot. Chef's Palette at The International Culinary School has good reviews with dishes prepared by student chefs but is only open a couple of days each week. Also in the area is a Publix supermarket with a neighboring Total Wine store. Further west near South Federal Highway, you can find a cluster of fast food restaurants and a CVS pharmacy. Galleria Mall by the beaches has a Macy's, Neiman Marcus, and an Apple Store. Take bus 40 from SE 17th heading east. To return to the ship, there is a bus stop in front of the main entrance on East Sunrise Blvd heading eastbound. Los Olas Boulevard has trendy boutiques and restaurants. For power shopping, Sawgrass Mills is 13 miles to the west and is a gigantic mall (6th largest in the US). The nearest post office is across from Walgreens and down the road a bit in South Harbor Plaza. Address is 1515 SE 17TH St and they are closed weekends. Cafes and restaurants may provide free wifi for customers. Starbucks on SE 17th has free wifi if you have a Starbucks card. There may be free wifi in the cruise terminals.